This 'Climbing Slings' article is part of the e-book - Trad Climbing Basics. 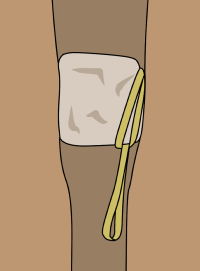 Climbing slings are strongly-sewn loops of nylon or dyneema tape. They're available in a range of lengths – your typical trad rack will have 60cm, 120cm and maybe a 240cm length sling on it, but bigger and smaller ones are also available. The length is given as the end to end distance, so the actual length of fabric will be double this. Slings are incredibly versatile, light, strong and cheap. 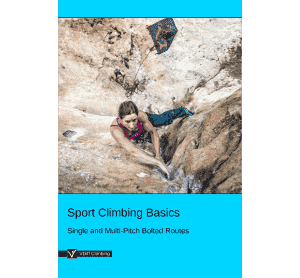 You'll find them useful on almost every trad route. 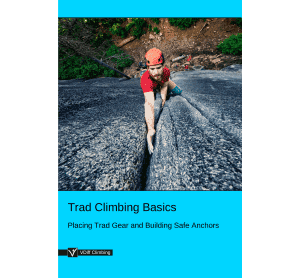 The most common uses of slings are to extend or equalize gear, either on lead or at the belay, but they can also be used as protection by themselves. The most common features to 'sling' are blocks and flakes. Simply put the sling over the feature and clip it to the rope with a carabiner. If your sling is big enough, you can tie it as a clovehitch around the feature. This reduces the chance of it being lifted off as you climb. 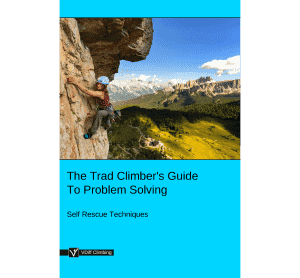 After placing the sling, give it a gentle pull in the direction of loading and wiggle it around to simulate how it may be pulled in a fall or by movements in your rope as you climb above. 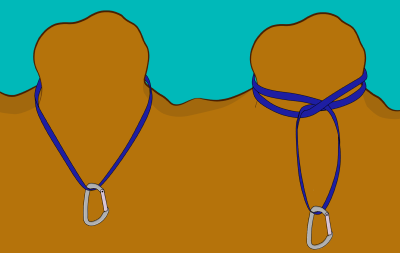 Slings can be threaded through a hole or behind a feature. 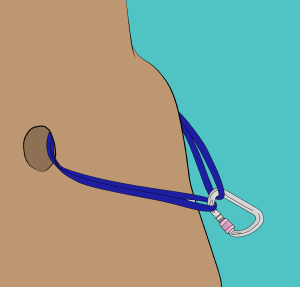 Simply poke the sling through the hole, pull it until both ends are even, then clip a quickdraw to it. 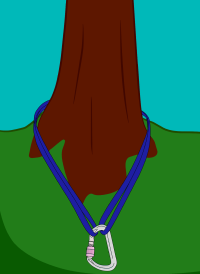 You can use slings as protection around trees. 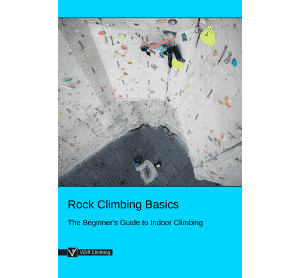 This is more commonly done at the belay, though many 'classic' British routes have mid-pitch trees. 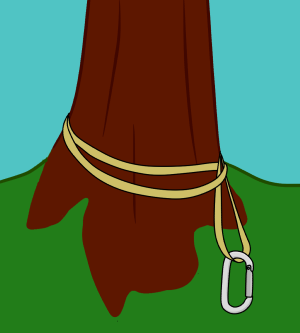 Simply pass one end of the sling around the tree and clip both ends together with a carabiner. 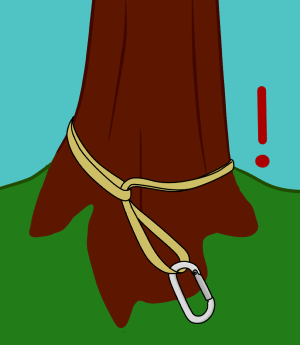 There will be less force on the tree if you attach your sling around the base of the trunk. This is especially important with weak or small trees. Although not ideal, you can girth hitch trees as shown. 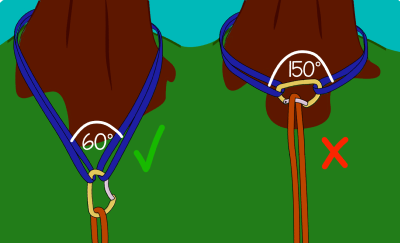 Make sure to adjust the girth hitch so it doesn’t bend across the sling, as this puts more force on it. If you have a longer sling, it is much better to tie it off with an overhand knot. This is stronger and more redundant than a girth hitch. A sling around a large block or flake can be a great piece of gear – if it’s solid. Inspect the rock and ask yourself how the feature is attached. Sling flakes as low down as you can to reduce leverage and be careful of fracture lines which indicate the feature is detached. 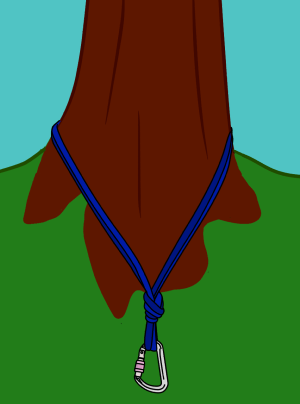 Slings can lift off once you climb above, especially if it's windy or if your rope is pulling on it. To help prevent this, you can wedge them in place with another piece of gear as shown. Alternatively, weight the sling down by hanging something heavy from it, such as a large hex. The most stable boulders are large, wide, flat-bottomed and are wedged in place by the ground they sit on. If a boulder rests on debris, is on a sloping ledge, or has a rounded base, it may not be stable. A chockstone is a rock which has become wedged in a crack. They are more commonly found in wider cracks and chimneys and can provide great protection when nothing else exists. Assess how the chockstone is wedged in place and be careful of large ones which could roll out onto you. Sling chockstones with a girth hitch on one side. If you sling the middle, the force of a fall could lever it out of the crack. If you don't have one sling long enough to fit around a tree, you can join two together. Do this by using a strop bend – this is basically a neat version of a girth hitch. Remember that tying any knot in a sling, including a strop bend or a clove hitch, reduces the strength of the sling by up to 50%. When placing a sling around a tree or rock feature, it's important to keep the V-angle less than 60 degrees. A greater V-angle could cause your carabiner to cross-load in a fall. 60cm slings are best racked either as extendable quickdraws or fit neatly over one shoulder. You can pull one off whenever you need it, but don't wear too many or they'll tangle together. 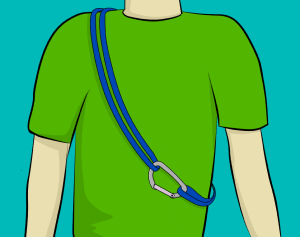 120cm slings can also be worn over the shoulder, with a carabiner clipping the two ends together. Instead of pulling them off over your head, simply unclip the carabiner and pull. 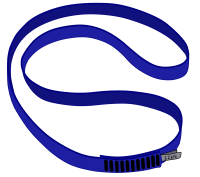 Either length can also be twisted to be racked onto your harness with a carabiner. 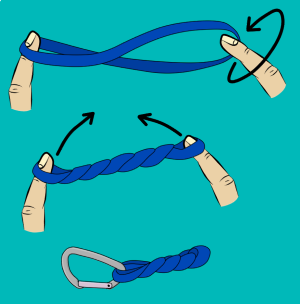 For a 60cm sling, hold it on one finger of each hand, and twist one end round a few times. Fold the sling in half and you'll find the strands twist together neatly. Just clip a carabiner through the two ends to rack it. The same can be done with a longer sling, just double it up first for a 120cm, or double it twice for a 240cm.